The dynasty that took control of Naples after the period of Norman rule drew Italy centre-stage of the power struggles of medieval Europe. Like the Normans before them, the Swabians were foreign dominators. They were Teutons with ideas of kingship and feudalism which found little favour with their subjects, or with the long succession of Popes who had to deal with them. Concerning Naples itself, it is not easy to say that one thing or another is a direct legacy of the Swabians (the University of Naples excepted) because building in this period was mainly limited to military installations built to protect and control the city, and the demolition of such constructions (baronial castles, etc.) which threatened Swabian rule. The first Swabian to lay claim to the Sicilian Crown was Henry VI, by dint of his marriage into the Norman Hauteville line. As Henry was already King of Germany and Italy by election and had hereditary claims on the Kingdoms of Bologna and Sicily, Pope Urban II wisely foresaw the Papal States in danger of being crushed between the realms of one man. He chose to favour the pretender Tancredi for the throne, thereby beginning the process of Papal opposition to Swabian rule which was to typify the 13th century and draw most of Europe into the fray. Henry's first attempts at taking control petered out before the walls of Naples and, his army stricken by pestilence, he was forced to withdraw. On his second attempt, following Tancredi's death, he found little opposition and easily reached Palermo, where he was crowned on Christmas Day, 1198. His harshness in dealing with those who had resisted him led to his being nicknamed 'the Cruel' — even the remains of Tancredi were disinterred and despoiled of their royal trappings. His cruelty had precise political dimensions, though, for he had a large empire to control in absentia, and his rule was troubled by Papal and other anti-Swabian plots. When Henry died in 1197, he left his subjects the memory of his severity, and a three-year-old heir, Frederick, under the tutelage of the Pope. This tutelage lasted until the boy's coming-of-age in 1208, although he had been crowned ten years earlier. Frederick inherited a troubled, rebellious kingdom, and quickly discovered how powerful the Church had become through the agency of his erstwhile guardian, Pope Innocent III. The city of Naples was under strict military government during this period but here, too, the power of the clerics and the building of defences by barons gave all the signs that the city was preparing to challenge the King. Frederick's problems were worsened by the arrival on the scene of a new German Emperor, Otto of Brunswick, keen to exercise his rights in Italy and claiming the Sicilian Throne. Naples recognised Otto as rightful Emperor and did not impede him on his march south into Calabria. Pope Innocent, perhaps hoping to maintain the balance of power, aided Frederick's cause by excommunicating Otto and absolving his subjects from their duty to the Emperor. This helped cause some important defections in Otto's ranks and was instrumental in deposing him at the Diet of Nuremburg in which Frederick was recognised as Emperor. Like many Italian cities, Naples found itself unavoidably caught up in these struggles. The instability brought about by the constant warring suppressed and hindered trading, and pirates took advantage of the situation to terrorize the seas and islands. The city had divided over Otto's claim but now had to reconcile itself to the new Emperor, Frederick II, who, after victory by his supporters in the battle of Flanders (1214) and the death of Otto (1218) was uncontested. Frederick's first task was to organise the administration of the many and diverse peoples and lands constituting his Empire. To this end, he opted for a de-centralized form of administration, placing trusted collaborators in positions of power so as to allow himself to concentrate on his Sicilian realm. Frederick passed one month in Naples in 1220 and returned again in 1222 and 1224. The city was shown some favour insofar as maritime traffic and trade were concerned but any hopes the Neapolitans entertained of regaining any large degree of autonomy were soon dispelled. Naples, second only to Palermo in importance, was too strategically placed to be allowed to determine its own future. This blow to the civic pride of the city, coupled with the exacting taxes imposed, did little to endear Frederick to the Neapolitans despite the determination he showed to instill order and justice among his subjects by ordering a general disarming, beginning reforms of the legal system, and stopping the barons from squeezing their vassals dry. Those barons who continued to claim independence were swept unceremoniously aside. On the occasion of his visit to Naples in 1224, Frederick conferred the Studio Generale on the city; an institution which survives to this day as the University of Naples (photo, right). The importance of this institution as a recognition of the status of the city may have failed to placate those who desired to be rid of the Swabians, but the Church did not fail to notice the implicit attempt by Frederick to break the Church monopoly of education and so undermine its influence. The State stood to gain a great deal from the foundation of the Studio, as it was a means of sifting out the best minds for the running of the Kingdom. ; consequently, Law was one of the most important subjects offered. But Theology also had its place and the Studio was able to boast no lesser a tutor than Thomas Aquinas. In 1228, Frederick, by now twice a widower and excommunicated for failure to lead a crusade, left for the Holy Land. The campaign was successful and he was able to crown himself King of Jerusalem. This self-coronation went unrecognised by the Pope, who, anyway, had taken advantage of the King's absence to stir up dissent in the realm. Naples, nonetheless, remained loyal and provided men to replenish the King's tired army upon his return from crusading. Pope Gregory, given the success of the crusade, was constrained to lift the excommunication. With stability restored, Naples found its maritime trade prospering: linen and silk exports grew to unprecedented levels and its shipyards and craftsmen flourished. However, both the many heretics and certain religious orders felt Frederick's wrath. Throughout his realm, he gave heretics a miserable time — possibly to maintain favour with the Pope; on the other hand, Franciscan and Dominican monks in Naples, working under the Pope's orders, angered Frederick by their sedition. These two orders would eventually be expelled from the realm in 1239 — the same year in which teachers and students had to beg a disgruntled Frederick not to close down the university. The Emperor's severity with troublemakers even extended as far as his own son, Henry, King of the Germans. Frederick had him imprisoned for life for usurpation and, as if to rub salt into the wound, took Isabel of England, whom Henry had hoped to marry, as his third wife. Relations with the Pope worsened in 1242 when Innocent IV was elected and quickly made clear his intentions. Frederick suffered his third excommunication and everywhere found the Pope's agents fomenting revolt and even plotting against his life. The prisons of Naples and Sicily began to overflow with political prisoners, and torture, hangings and burnings were the order of the day. Frederick of Hohenstaufen died unexpectedly in 1250 but, despite having had eighteen children, left only Corrado as his legitimate heir. 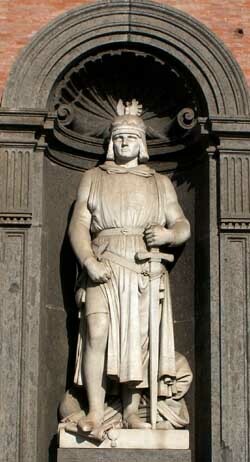 Manfred, third-in-line to the throne, had care of the kingdom until Corrado's arrival from Germany but the Pope's agents had already done their work of readying Naples and other important centres for revolt; they awaited only the Pope's word that the time had come to liberate themselves from the Swabians. Naples declared itself a free commune under the sovereignty of the Pope, and again the Franciscans and Dominicans were at the forefront of the movement to resist the Swabians. Manfred besieged the city but failed to make any impression on the Neapolitan walls until 1253 when Corrado arrived from Germany at the head of a strong army. The desperate Neapolitans, reduced to eating the leaves from the trees, were forced to capitulate. Corrado saw that there was a profound disillusionment with the Pope for the failure of his promised aid to the beleaguered city to materialise. He wisely took the opportunity to ingratiate himself to the city by limiting his punishment to the destruction of the walls and certain fortifications. The Pope was now casting his line around Europe, baited with the promise of the Crown of Sicily. Approaches were made to Charles of Anjou and Edmund of England and although this chicanery at first came to naught, the Pope even went so far as to crown Edmund King of Sicily. Upon Corrado's death, Manfred jockeyed himself into kingship by spreading false rumour of the true heir's death. This latter, Corradino, had been placed, surprisingly, under Papal tutelage, so Manfred found himself at war with the Pope and, against his better judgement, forced to meet and defeat the Papal army in battle. He then moved on to conquer a revolting Naples, abandoned once again to her fate. Manfred, angry that Naples had risen again in defiance of Swabian rule, refused to recognise the importance of the city by denying it any special dispensations; although he did show the prestige the Studio had gained by ordering its rebuilding. With his army defeated and Manfred showing himself an able governor of his kingdom, Pope Urban IV (elected 1261) showed himself as anti-Swabian as his predecessors by proffering the Sicilian Crown to Charles of Anjou (brother of Louis IX of France) if he were prepared to come and claim it. Charles showed himself eager and even agreed to the risky idea of going to Rome without an army. Manfred failed to attack the Holy City whilst he had the opportunity, preferring instead to use diplomacy to have Charles expelled from Rome. Having failed to achieve anything by these means, Manfred was eventually forced to draw up his forces to face Charles' army of 30,000 Frenchmen, which was marching down into Italy. The year was 1266, and the Pope finally saw almost seven decades of Papal skulduggery give results when Manfred's army was completely routed in battle near Benevento, and the King himself hacked down on the field. The road to Naples was now wide-open and the way to the throne became equally clear when Manfred's entire family fell into French hands. The two-century Angevin rule of southern Italy had begun.